Classic Gameplay Reinvented: From huge-scale multi-enemy combat to dizzying feats of acrobatic prowess in gigantic environments enhanced by the Prince's ability to control nature and time, Prince of Persia The Forgotten Sands will push the Prince's prodigious abilities to unseen levels. A Blockbuster Experience: Prince of Persia The Forgotten Sands will offer players unforgettable set pieces made possible by the advanced technology offered by the award-winning Anvil engine. With all-out war at the gates of the kingdom, the Prince's abilities will be challenged like never before through the course of epic wow moments. Mastery Over Nature: Wielding powers of nature and time, the Prince will have unparalleled mastery over his environment and his enemies. The Prince will discover that harnessing the forces of nature itself will prove to be a devastating companion to his ability to rewind time. Return of a Fan-Favorite Franchise: Set between Prince of Persia: The Sands of Time™ and Prince of Persia: Warrior Within™, Prince of Persia The Forgotten Sands will provide fans a new chapter in the Prince of Persia universe and deepen their understanding of the Sands of Time series. © 2010 Ubisoft Entertainment. All Rights Reserved. Based on Prince of Persia® created by Jordan Mechner. Ubisoft and the Ubisoft logo are trademarks of Ubisoft Entertainment in the U.S. and/or other countries. 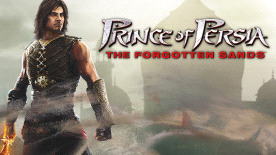 Prince of Persia and Prince of Persia The Forgotten Sands are trademarks of Jordan Mechner in the US and/or other countries used under license by Ubisoft Entertainment.